UNWORN, BRAND NEW. Beautiful dress with sweet heart neckline. Ivory silk taffeta with zip/button up the back instead of the standard lace up. Corset inside making dress amazingly flattering! 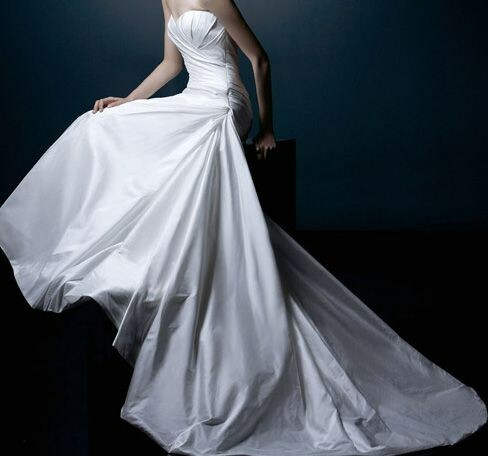 The dress is classic and elegant, no beading/jewels but could be easily customised to suit your taste. Have more photos if you would like to see more. Standard length dress (am 5ft9 and fitted me with medium sized heels on). Dress is a 16 but came up small (am usually 14-16) - if you're a size 12-14 the dress could be easily taken in - since no complicated jewels etc this would be very easy to get done. Really is a stunning dress. Sensible offers will be considered, I paid £1200 for the dress. Paypal payments preferred or cash/chq. Can be posted within a matter of days. Based in London/Essex if you woud like to view.